Back in the day, it wasn’t terribly uncommon for out-of-state applicants to be flown-in for a law enforcement oral board interview. The candidates that landed round trip airfare across country in order to sit down for a 30 or 40 minute interview didn’t have mediocre resumes. These candidates had application packets so full of positive accolades the department was already impressed enough to fork over a few hundred dollars, just to try the shoes on. Those days are gone, and replaced by Skype and other live video interviews. With this comes news that can truly work in your favor. Most people, and I would tender a guess that “most” means in the 90 percentile, present poorly, if not exceedingly poorly during a video interview. That, for you, is great news because you can learn quickly how to appear as the perfect video interview applicant. There are two key reasons that video interview candidates fumble badly on camera and the first reason has already been mentioned. Camera! 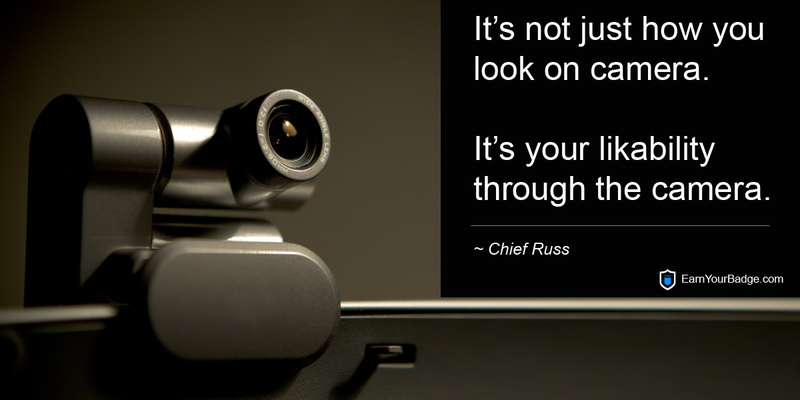 Generally speaking, people hate looking into the lens of a camera and particularly, video or web cameras. The depersonalization of looking into an intimate object causes candidates to feel as though they’re talking to nobody. It’s as though the applicant presents him or herself like there really isn’t anyone listening. They, the interview panel, is listening if not eve more intently than they would during an in-person interview. The second reason for the display of such poor on camera interview skills is quite simply, most learning institutions don’t teach students how to do it. Short of taking lessons in acting, you must, without fail, look into the lens of your web cam and pretend that you’re looking at the face of a person when answering a question. You can, and should take your eyes off the camera lens, every once in a while, very briefly. While forming an answer to a question, look up for a second or two, maybe three, but then, immediately back at the lens. If you don’t look at the lens enough, you’ll appear disinterested and conversely, if you stare non-stop into the lens, they’ll think you’re psychotic. There’s a fine balance and you have to hit the mark on eye contact. Your time to shine in this interview comes by way of looking into the lens when being asked a question, but to also look at your screen when being asked a question. Don’t look at the lens when they’re talking, look at them, on your screen. You want to pick up any physical mannerisms or body language if posable. Be sure also to position your camera, if it’s mobile web cam, as close to the screen as possible. The further from the screen, the more awkward it will appear as you move from camera to screen and back. It’s imperative that you smile, often. You don’t have to give them a toothy grin throughout the interview, but you absolutely have to smile politely, and often, throughout your interview. It also helps to look contemplative when you’re being asked a question, and, while your forming your answer. Again, don’t overdo it, but appear appropriately engaged. It seems to be irresistibly tempting to look at your hands, the desk in front of you, the side of your screen and any other object other than the lens. Resist this temptation as though your life depends on it, because in reality your next, in-person interview with that agency does depend on it. If you fumble around trying to get “things working” at the beginning of your interview, or the middle, or the end, you may literally be ending your shot at working for that agency. Their stuff will be working flawlessly, and they expect yours to as well. If by some chance their equipment does falter, wait patiently and remember, you may not be able to hear or see them, but they might still have eyes and ears on you! Finally, as far in advance as possible, do a dry run with a trusted and intelligent friend on the other end. Ask them to critique not only the functionality of your web cam and audio equipment, and whatever software you’re using, but also your demeanor, your on camera appearance as well as your interview disposition. A few more video interview tips for the perfect video interview. Give the panel a pleasant visual and audio experience. No kids, no pets, no roommates, no ringing cell phones and put a DO NOT DISTURB sign on your front door to dissuade a knock or doorbell ring. Be aware also, that while you’re interviewing the panel is doing their best to get to know you. If your background is a pile of dirty laundry, you’ve done yourself no favors. Be sure that what they see in the background is pleasant. You should also dress as though you’re interviewing in person. I’ve seen people on video interview that look like they just finished mowing the lawn 30 seconds before hookup. It’s a sure bet, you won’t be considered for hire if you don’t dress the part. Don’t fidget or squirm and by all means, don’t sit in a swivel or reclining chair, because you’ll swivel or recline, guaranteed. Finally, be aware of your distance from the camera. The best framed shot will present you with a few inches from the top of the screen to the top of your head. An all-star doesn’t need to be all face, your perfected interview skills will fill the screen perfectly! Give the panel a pleasant video experience, and they’ll likely give you a great score!